A mature Jack O'Lantern mushroom (Omphalotus illudens, aka Omphalotus olearius) growing from a decaying root, near an old stump. Older cap showing sunken center, and gills slightly descending stalk. Species is bioluminescent (gills glow an erie green when eyes adjust to light). Poisonous. 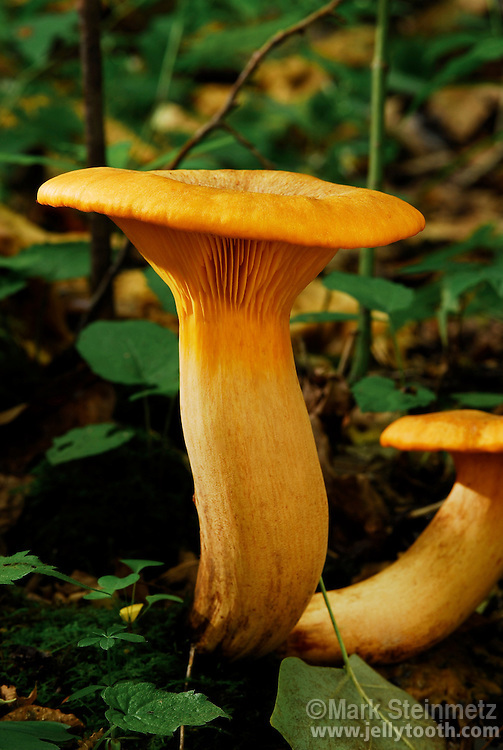 Sometimes mistaken with the edible orange Chanterelle species, due to the color and superficial appearance of growing from the ground. Photo taken in September.